Holiday.gr - ARKI, a trip to a myth! Been to ARKI ? Share your experiences! Arki is the biggest of all small and rocky islands, north of Lipsous. It is an isolated island, an ideal “refuge” for those seeking for complete “detachment” from the rhythms of the city. The only settlement in the island is built along the port and has less than 100 permanent residents. As for its graphic port, it is located in the depth of a safe cove, with many rocky islands in the entrance, protecting it from severe winds. 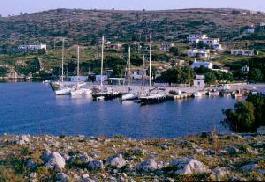 It is worth visiting Arkous on a daily trip or for short-term vacations and meet the calm feature of Dodecanese. You will swim in the beautiful beaches or you can take the boat and tour around the island. You can anchor in the isolated islands of unique beauty like Marathi or Marathonisi with a beautiful sandy beach.